"How important it is for each of us to return repeatedly to the holy scriptures and thereby gain experience and confidence in hearing and feeling His voice. As we regularly study the holy scriptures, 'Behold, the words of Christ will tell you all things what ye should do' (2 Ne. 32:3). 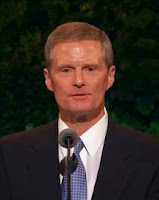 "In our process of coming unto Christ, hearing and feeling the voice of the Lord and knowing His words are essential. The Savior taught, 'My sheep hear my voice, and I know them, and they follow me' (John 10:27; emphasis added). Thus, hearing His voice precedes properly following Him, 'for mine elect hear my voice and harden not their hearts' (D&C 29:7). Truly, we can receive instruction from Him and follow Him. And the spiritual capacity to hear, to feel, and to follow is available to every member of The Church of Jesus Christ of Latter-day Saints—and that capacity is strengthened through diligent study of the scriptures. 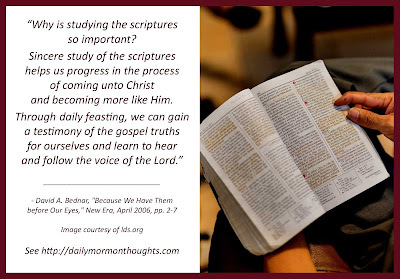 "Why is studying the scriptures so important? Sincere study of the scriptures helps us progress in the process of coming unto Christ and becoming more like Him. Through daily feasting, we can gain a testimony of the gospel truths for ourselves and learn to hear and follow the voice of the Lord." Why does scripture study matter? Why does daily scripture study matter? Because we "thereby gain experience and confidence in hearing and feeling His voice." It puts us in communication with the divine voice, training us to listen and respond. "The spiritual capacity to hear, to feel, and to follow... is strengthened through diligent study of the scriptures." The more we immerse ourselves in His words, the more we are prepared to receive His words directly to our own hearts and minds. If we truly believe these promises, why would we not want to feast daily and claim these blessings?